Bees provide indispensable pollination services and have become important models for the study of learning and memory, plant-insect interactions and social behavior. Here we describe the nuclear and mitochondrial genomes of the facultatively eusocial orchid bee Euglossa dilemma. Comparative analyses of the genome assembly to the honey bee genome revealed high conservation of gene synteny between the two species, despite an order of magnitude difference in genome size and 80 million years of divergence time. 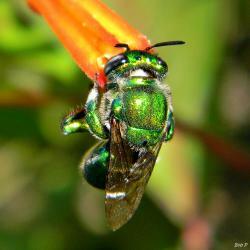 Our study provides valuable genomic resources for genetic analyses on the ecology, evolution, and conservation of orchid bees and the evolution of sociality in bees.